The previous year, Othenin-Girard had directed Halloween 5, which I vaguely remember as… not entirely sucking, though I could be wrong. For his follow-up, he delivered this loony tune about Adam’s first wife, Lililth (Jank), returning to Earth in human form, in order to… target the employees of a fashion magazine? Yeah, I have stared at those last seven words for a good minute, and they don’t make any more sense now, than they did when we were watching the film. Even to get that part, you have to go through Lilith’s rebirth into this, which occurs with no context beyond a slab of portentous narration, about how “she shall stalk us forever, walking in the shadows, sowing the seeds of discontent, reaping a harvest of souls,” etc. etc. This opening sequence certainly feels like forever. We eventually get to the fashion magazine part, where nice guy hero, Craig (Ashby), works as the art director. His boss is Rita (Black), and her boss is… largely irrelevant, since he quickly becomes a victim of Lilith’s predatory ways. Lilith, being Lilith, has the ability to make any man fall head over heels for her. Or, indeed, any woman: for having offed a few employees, she randomly decides it’s high time for a career change, choosing to become a fashion model herself, which she accomplishes by turning her wiles on Rita. Meanwhile, Rita’s sister is a jewelry designer, who is falling for Craig, and who works mostly in silver. You will not be surprised to discover that this is a significant plot point. Though at the end, it turns out that true love is all you need to conquer this particular hell-spawn. Perhaps the most memorable element is a very young Doug Jones, in his second ever feature, quote some time before becoming Guillermo Del Toro’s muse. Jones, in a rare role not involving industrial quantities of latex, plays a wild and crazy guy – imagine a stick-insect crossed with Jim Carrey. He almost falls for Lilith, only to be dumped for a better meal-ticket, and who consequentially falls through a plate glass window and busts his knee open. Funnily enough, this doesn’t seem especially nonsensical, in the context of the film overall, and it doesn’t stop him from becoming Lilith’s minion (as shown, top). Movies about the fashion industry are a sure-fire bet to date badly, and that’s absolutely the case here. I’m open to arguments as to whether it’s the clothes, the hairstyles or the Euro-disco soundtrack which have stood the test of time least well. 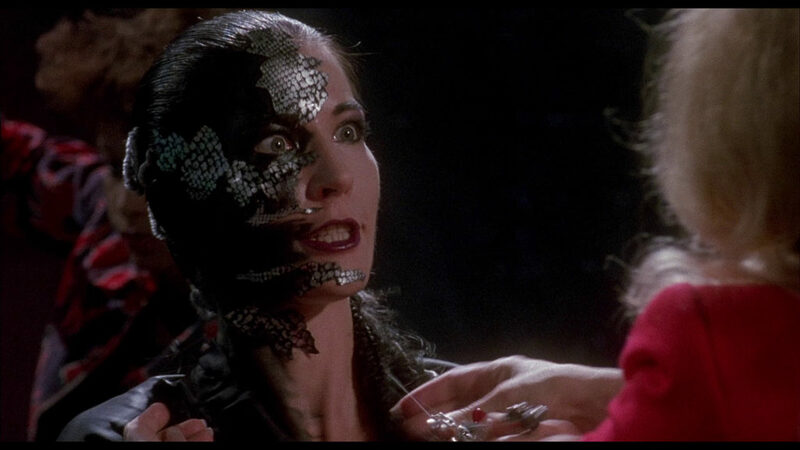 There’s even one scene where the clothes and hairstyles blend into each other, in a way only the eighties ever could: at no other point in cinematic history could “looking like a post-inferno Terminator” be considered a cutting-edge fashion statement. Though technically, this would be a nineties film, its heart, gall-bladder and spleen are firmly rooted in the previous decade. The script is no less naive, including a bag lady who has been spouting her own portentous nonsense, warning everyone who will listen about Lilith. Which would be absolutely nobody, until the point where it’s suddenly necessary to the plot. Despite occasional half-decent gore effects from Steve Johnson, it’s all entirely forgettable, except for the crossing paths of Jones, with his ascending career trajectory, and Othenin-Girard, whose filmography was already on its downward arc.